–Standardizing document management and reporting protocols for EE projects can bring economies of scale. –With a standardized NEER, states can add energy efficiency to their clean power portfolio with reduced administrative burden. –Registries that create rigorous accounting through the creation, transactions and retirement of compliance instruments slash transaction costs and make public policies like RPS feasible. NEER has the potential to unlock access to potential compliance markets for EE Providers. The state of Connecticut has incentivized EE project development through market-based tradable credits with a “Class III” designation within its RPS. To see how Connecticut uses EE credits, check out our case studies. Working under contract for and in partnership with The Climate Registry, E4TheFuture is facilitating a two-year, state-driven stakeholder process to develop the draft principles and operating rules documents. This work is part of the States Initiative on Principles and Governance, one of four components in the overall NEER development process. If you want to learn more about NEER, see a five-page fact sheet, a recorded webinar, or contact The Climate Registry. Photo: Many of the NEER stakeholders gathered at the September 2016 NASEO annual meeting. Courtesy of The Climate Registry. Disclaimer: This blog post has been prepared by and is the sole responsibility of E4TheFuture. 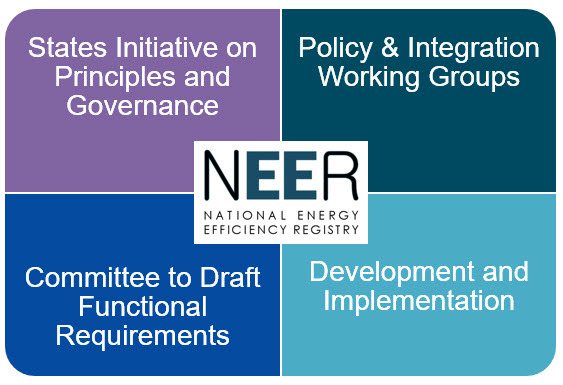 E4TheFuture is not a National Energy Efficiency Registry (NEER) project partner and does not represent the U.S. DOE, the six states, and/or partners The Climate Registry (TCR) and NASEO. As such, the views expressed in this document are strictly those of E4TheFuture and may not coincide precisely with information provided by the above-referenced project, participating states, or project partners. Pat Stanton, E4TheFuture Director of National Policy serves as a consultant to TCR and as a member of the Steering/Advisory Committee for the NEER project; this document is not paid for under the DOE award.